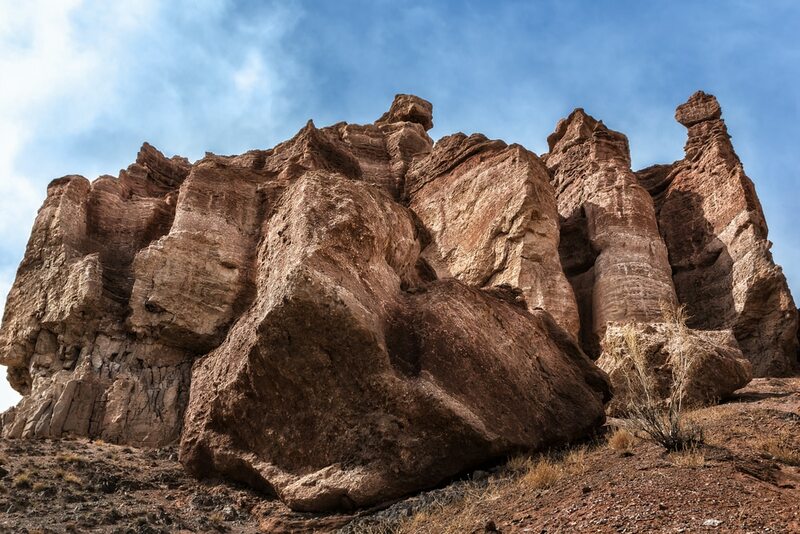 The desert- an unforgiving landscape environment filled with dangers present at all times. This is the final resting place of unprepared souls, with their bleached bones perfectly preserved by the hot sun and the hungry vultures. Think you can survive out in the desert? It’s definitely a beautiful place, yes, but the hot of the sun and the cold of the night will catch the unprepared. 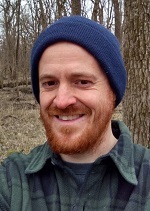 Lack of working knowledge about how the environment works, lack of skills and the lack of adequate desert survival equipment will make short work of you in a hurry. So how does one survive out in the desert? It’s not what you’d expect. Be prepared for a wholly unique environment where the standard survival rules do not apply. Here in the desert, there are different rules you should follow. 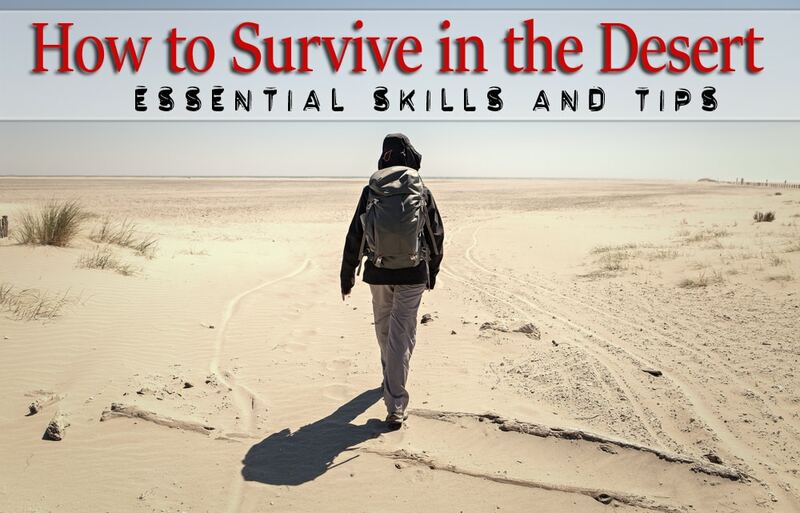 Preparation is still the key element to survival success, and the desert is no different. If you’ll be in the desert, whether just passing by to get to the original destination or planning to stay for days of backpacking, you’ll do well to pack and prepare a few essential items. We’ll be using the Rule of 3s as a guide. Our bodies can only survive for 3 days without water. 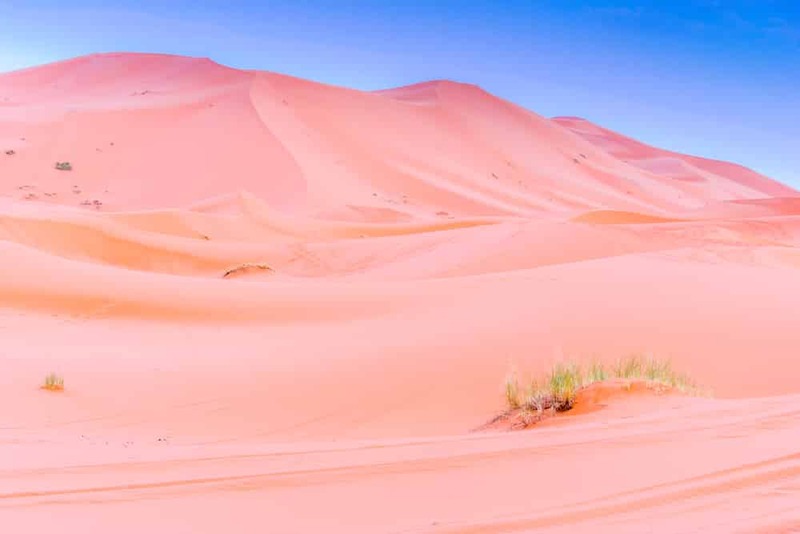 The hot desert and the humid environment accelerate the dehydration process. Even breathing under the searing noon sun will cause you to lose fluids. To compensate, you’ll need at the very least a gallon of drinkable water for each person. Two gallons is optimal. Keep in mind that you can create fire and make shelter, but out in the desert, you cannot make or find water. Before leaving, you should inform someone you fully trust where you are going. This practice should be done anytime you’re heading out in the wild. It’s a sound survival tip. It’s not expensive, and it only takes a few minutes of your time. Set aside 10 to 15 minutes and speak with a close friend or a family member in person or over the phone. Have them write down where exactly it is you’re going, and when you’re expected to be back. Resist the urge to change itineraries and stay on your planned route. So what happens when your car breaks down in the middle of the vast desert, or that you’re days out in the desert, with little to no hope for rescue? Your trusted person will start to worry why you’re not back yet. He or she will then inform the local authorities, and they will send out a search and rescue party. Plus, they will know where exactly to look. Also, take some time to read other people’s work about the desert area you’ll be visiting. Their past experience will help future travelers what to expect. The general rule about being stuck in the desert with your vehicle is to never, ever leave it. The only exception to this golden desert survival rule is when you are 100% sure that there’s a nearby civilization. This is the only time you may abandon your vehicle to get to civilization and increase your chances of survival. Wait until the extreme heat passes and head out in the morning, the late afternoon or in the early night. The sun can play tricks with your vision and you could get lost further out. Why would you need to stick to your vehicle? It’s an instant survival camp. Your vehicle will prove to be very useful because it contains a lot of survival equipment. Plus, it’s readily visible under a helicopter search. 1) Hood. A raised hood is a universally accepted sign that you are in trouble and that you need vehicular help. 2) Fuel. It can get you places and can double as a medium for making fire, which is extremely helpful when out in the freezing temperatures at night. Take care to use gas as it is very volatile. 3) Battery. It can charge your survival equipment and create sparks to make fire. 4) Oil. It can burn during the day or during the night and create thick, black smoke for signaling purposes. Rescuers will be able to see it from miles around. 5) Mirrors. Take them out of the vehicle and use it to signal passing vehicles when you’re stuck out in the desert. 6) Roof. Doubles as an instant shelter from the hot sun. Stay under the roof during peak daylight hours. Remember to open the windows and the doors to let air and heat pass by. 7) Horn. Make noise to attract the attention of nearby travelers. The horn can be used if you want to save your breath calling out for help. Don’t panic when you’re facing a survival situation. Stop, think and plan for what you’re going to do. Don’t leave you vehicle as it could be very useful later. If you really must leave your vehicle, make sure to leave a helpful note inside the car or on the windshield. Information such as where you’re headed increases your chances of being found and rescued. Do a full-body inspection of your vehicle the day before you leave for your desert adventure. Check the tire pressure, the electrical system and see if the fluids are all topped up. Create your desert survival equipment and put it in the trunk. Do a drive test before heading out to your destination. What you don’t want is your car breaking down in the middle of the desert just because you forgot to check the oil or the batteries. Visit your local auto shop and make sure everything is in tip-top shape. What would survival be if not for the quintessential survival kit and equipment? Never leave home without it. Survivalists should have their everyday carry kit with them and in the vehicle at all times. It’s one of the golden rules for preparedness. If going on foot, make sure to put the everyday survival gear into a backpack. If you’re bringing in a vehicle, don’t forget to your everyday gear in the back. You’ll thank the stars that you remembered to pack your everyday carry kit when the desert decides to throw in a monkey wrench to your desert adventure. If you think that it’d be a waste of precious space and weight to bring your everyday survival carry with you, you’d be wrong. It’s infinitely better to bring it and not have to use it than not bring it and suddenly need it. While most survival scenarios can be potentially avoided, some cannot and these are the times you’ll appreciate the fact that you brought your everyday survival bag with you. 1) Water. You’ll need multiple ways on storing and making water. Instant water and small water purification devices are always welcome. 2) Signaling Devices. Bring your smart phone and a means to charge it. Pack in compact, powerful flashlights, signal mirrors, glo-sticks, lightsticks, chem lights or signal flares. Space is at a premium, so if you can get an all-in-one device, i.e, a flashlight that can charge your smart phone, the better. 3) Directional Equipment. GPS devices, a good compass and a topographical map of the desert area. 4) Protection. This can be interpreted in many ways. Protection starts with what you’re wearing. Out in the desert you’ll need the proper dress attire. Cover the essential body parts from the hot searing reach of the sun and the burning air. You’ll need sunglasses and a wide-brimmed hat. If you can, bring a reflective tarp or blanket, and items that could help you create a makeshift shelter when needed. 5) First Aid Kit. All everyday carry bags will need first aid equipment. 6) Fire. Ferrocerium rods, magnesium blocks and good old lighters should be brought in your survival pack. Fire can do many helpful things. It can be used as a signaling device and keep you warm during the night. It can be used to purify water and help you mentally focus. Keeping cool is one of the most important things you’ll need to keep track when you’re trying to survive in the desert. Does it stand that you’ll have to find sources of water in the desert no matter what? The simple answer is no. You could be defeated in your search to find drinkable water under the hot scorching sun. The effort alone will make you lose essential water and cause dehydration. Dehydration out in the desert is a bad thing. Water In is the amount of water you consume. Water Out is the amount of water eliminated by sweating and peeing. Dehydration occurs when your water in/water out balance gets out of whack. 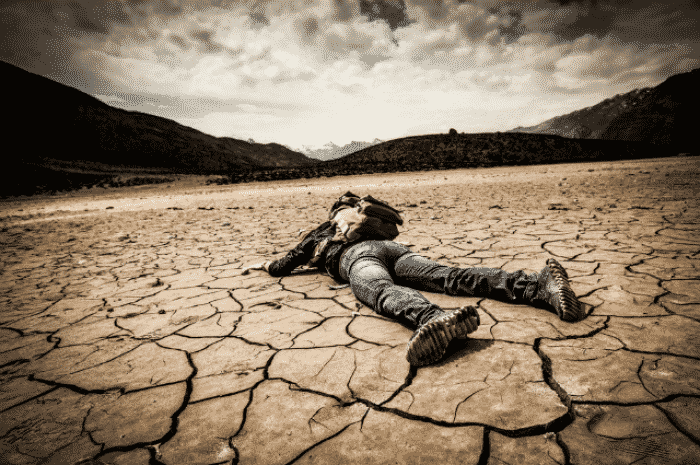 Dehydration is the leading cause of death out in the desert. You’ll do well to keep your dehydration under check using any of the two things- finding and drinking potable water, which increases Water In, or mitigating your Water Out. Believe it or not, you can ration the amount of sweat that’s coming out of your body. Stay out of the sun’s reach and go to a protective shade. Limit strenuous activity during noontime and be more active in the night. These will all greatly increase your chances of finding help and surviving out in the desert. Keep your skin temp strictly down to under 92 degrees Fahrenheit to avoid losing water. Put your sleeping bag or a cover into a bush to create an instant shade and to allow for cooling breezes. Don’t sit directly on the hot sand. If you must, tear out the seats of your new truck. Do yourself a favor and pack in a few sheets of sturdy plastic on your desert survival kit or the back of your vehicle as you head out to the desert. It only takes up a few space, and yet it can create one of the most important things you need to survive- the solar water still. 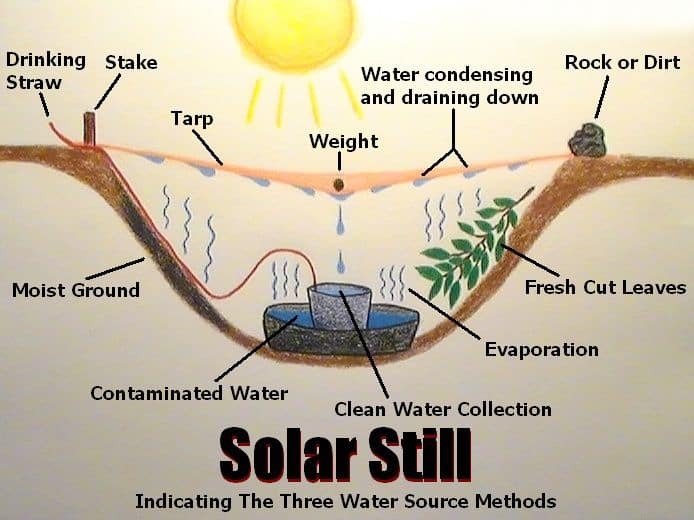 A solar water still is a device that can be used to collect water and moisture from the environment. Solar stills are a godsend in a desert survival situation. By themselves, they simulate a small, portable greenhouse which does several things. First, the heat enters the plastic barrier. It gets trapped and could not get out easily. The heat in the plastic forces the soil’s moisture to vaporize. A humid atmosphere is formed under the plastic barrier. Temperature invariably drops as the sun goes down, from which the moisture from the air comes up and forms on the plastic. The condensed water forms and drops in the small container you placed in the center. Step 1. Dig out a round hole. Make it several feet deep and a few feet wide. Step 2. 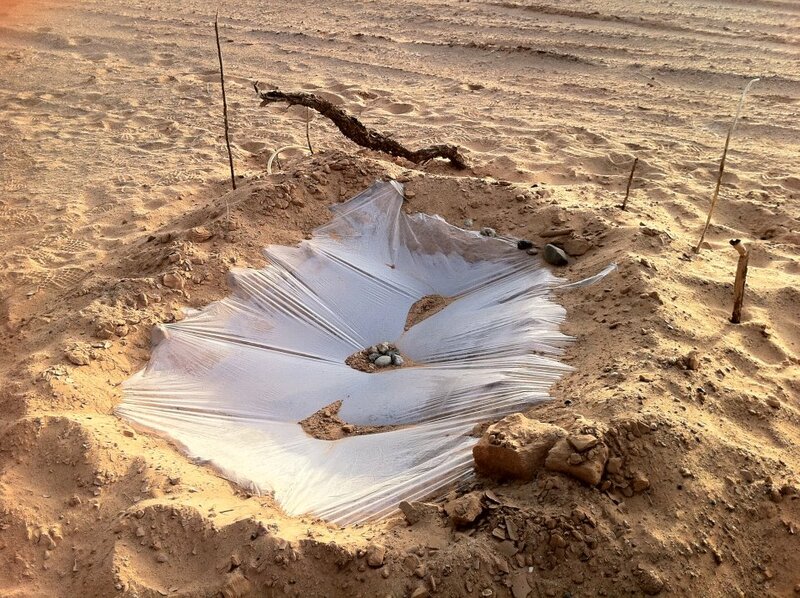 Put in a collection pit in the center of the dug hole using a plastic sheet. Step 3. Stretch out the plastic sheet across the dug hole. Step 4. Get some rocks that will hold the sheets in place. The setup should be that the sheet is off the ground, tapering to a drop as it approaches the middle of the dug hole. An easy way to make this happen is to put in a medium-sized rock in the middle of the plastic sheet. The rocks on the perimeter of the sheet should hold everything in place. Step 5. Wait for the plastic sheet to start accumulating precious water. You’ll see condensation, and then a few drops will start to appear. The moisture will gather together and form in the plastic sheet’s center. The condensed water will form when night comes on, and you’ll have drops of potable water collected in the middle of the solar still. Do an ocular inspection for the most obvious signs of water. 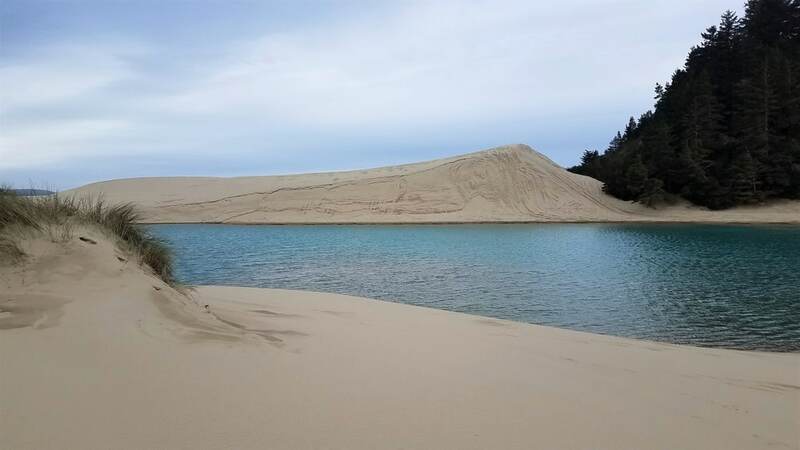 Get to higher ground- climb to a huge rock outcropping or a tall dune, and start to look for reflections off the sand. Under the sun and in the sand, water will shine like precious diamonds. If you have a pair of good binoculars with you, the better. You’ll have increased range and more accurate sightings. If you’re lucky, you’ll find other useful and/or helpful things aside from locating water sources. The presence of animals usually indicate a potable water source. Bring your sight over to the skies above and search for birds. The fact that doves and pigeons won’t be able to survive without water will be especially useful here. Be on the lookout for small bees as well- they are just about 1km from nearby sources of water. Listen for the buzzing sound and keep your eyes sharp! Plants and other vegetation need water to survive. If you see a smattering of grass or cacti in an area, then chances are there’ll be water to drink. A tree root can contain water if there was reported rain recently. Try to brush up on different desert vegetation, as they contain useful information on how far the water source is below the ground. 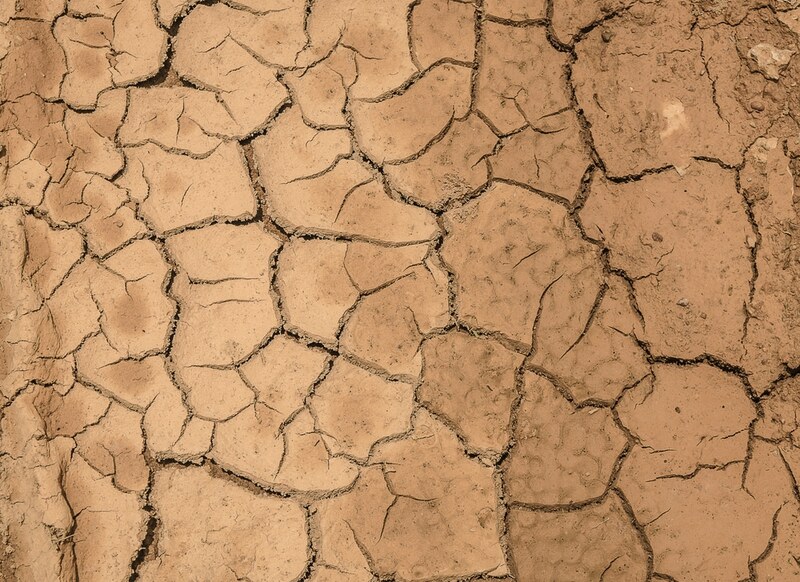 Check for telltale signs of dried up lakes and rivers. The searing desert heat will evaporate the water from the surface, but water under the surface will continue to stay and be available. The beds should fill up as soon as there’s an occurrence of rain. If you spot one, dig a bit and you’ll find water. Plant dew is also a reliable source of water out in the desert. Just before the sun sets out in the morning, dew forms on plants and on cacti. You can use this to your advantage by waking up early, then squeezing out a few precious drops. Put over a cloth overnight and drink the dew in the morning. Here’s a few movie myths that we need to dispel. Sure, you can drink water out of cacti, but you will have to know which ones are good for you and which ones aren’t. Many cacti species are extremely toxic. Ingesting its fruits and drinking the juice that comes out of it can cause diarrhea. Diarrhea accelerates the dehydration process, bringing you much closer to your doom. So if you’re not sure, don’t drink the cactus water. Going hungry can be a health hazard in normal situations, but in desert survival scenarios it can prove to be beneficial. Why? Food is further down the line when it comes to a survival checklist of things. Water is higher up in the checklist. Therefore, not eating anything for as long as you can helps because you’ll need extra water in order to digest your food. The key is in moderation. Eat just so that you’ll have your energy. Refrain from eating up to fullness. If your water supply is running dangerously low, then it may be better to hold off that hunger for as long as you can. You can live for far longer without food than you can live without drinking water. Natural instincts mistakenly tell us that we could die of starvation more than dying of thirst, but do your best to think otherwise. The facts are real- a person can survive 3 weeks without food via an internal mechanism of feeding off your fats, and then your muscle fibers. That same person can die of thirst in about 2 or 3 days at most. Finding and making shelter from the sun is one of the best things you can do to ensure desert survival. It keeps your body temperature well-regulated. During noontime, it’s best to stop what you’re doing and find shelter from the burning sun by staying cool in the shade. Get much-needed rest and conserve both energy and water this way. You’ll need them when the sun goes down. During the night, it’s best to find food, water, travel and build a solar still. Natural shelters include hanging cliffs and large rocks. They block out direct sunlight and heat. You may be tempted to remove your clothing under these circumstances, but it would be best not to. The added layer of cloth keeps you from losing too much water via perspiration. It will also stave off the direct rays of the sun, keeping you off sunburn. There will be a chance that you’ll have to face a dust storm as you’re traveling the desert environment. You can create a makeshift bandanabandana for covering your mouth and keep off the stinging sand from entering your lungs. Here’s where a vehicle can prove useful. If you are in the midst of a dust storm, then simply go inside the vehicle and ride it out. If not, then you should find low-lying outcrops and large boulders and take shelter in them. Create the largest shield you can find and stay under. Think it’s all about the desert heat that will get an individual trapped out in the desert environment? Think again. The cold is just as deadly. Temperature drops to almost freezing out in desert nights, so you’ll need adequate protective clothing. Clothes and blanketsblankets made from wool or mylar are your best bet. They will keep you adequately warm at night. A Mylar sheet or a woolen blanket will be your best friend. Fire is also one of the things you’ll need to stay alive at night. If you are caught unawares with just a tank top and shorts, it can prove to be the difference between life and death. Pack in fire creation tools in your desert survival backpack and in your everyday carry bag. 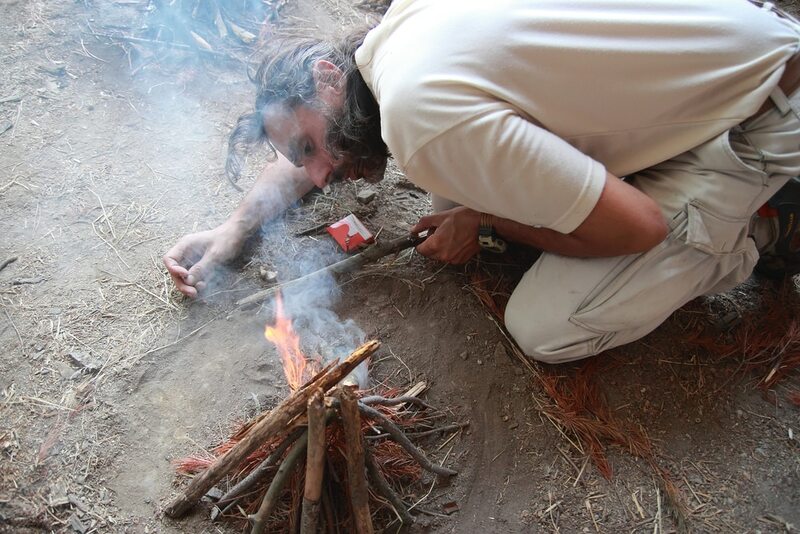 Gain the skills and knowledge on how to make fire using your natural surroundings. Keep your skills sharp with constant practice. The bow and drill is particularly useful and should be thoroughly learned. The best time to light a fire is during the night. Deserts can get very cold in at nighttime. The cold can bring about deadly effects such as hypothermia. This is probably the most surprising thing about the desert. Yes, you can get hypothermia out in the desert! Now that you know, you should take the proper steps to ensure this doesn’t happen to you. Fire can also protect you in more ways than one. Deserts are home to vicious animals out to get food. Predators such as bobcats, coyotes and mountain lions can be scared away using a live brand. Make sure to put in multiple fire starters in your backpack and in your vehicle. 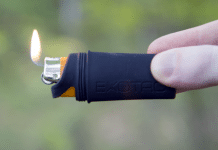 Electrical lighters, waterproof matches and fire strikers are all good firestarting equipment. If there’s anything you’ve learned in survival classes, it’s that you should keep a cool, calm and rational head at all times. In other words, don’t panic! 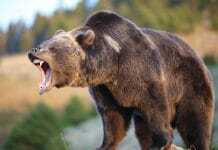 Going berserk will only lead to bad things that could endanger your chances of survival. Stop and think. Assume that there’s always a way to get out of the survival scenario that you’re in. Sure, it’s scary to see nothing but sand for miles and miles and no way to call for help, but don’t let that make you give up. Use the basic elements to survive. Fire can be used to signal help, keep warm during the coldest desert nights and scare off the dangerous animals that go prowling about. Fire can also be a means of psychological comfort. Our ancestors have it used for ages. People feel safer when near warmth and fire sources. Large animals will think twice before approaching a campfire. It helps to keep a good mindset and a wary expectation when surviving in the desert. Always expect the unexpected. Control the urge to panic. Always use your brain. Conserve precious energy and water as long as possible. Don’t think of the desert as your enemy. 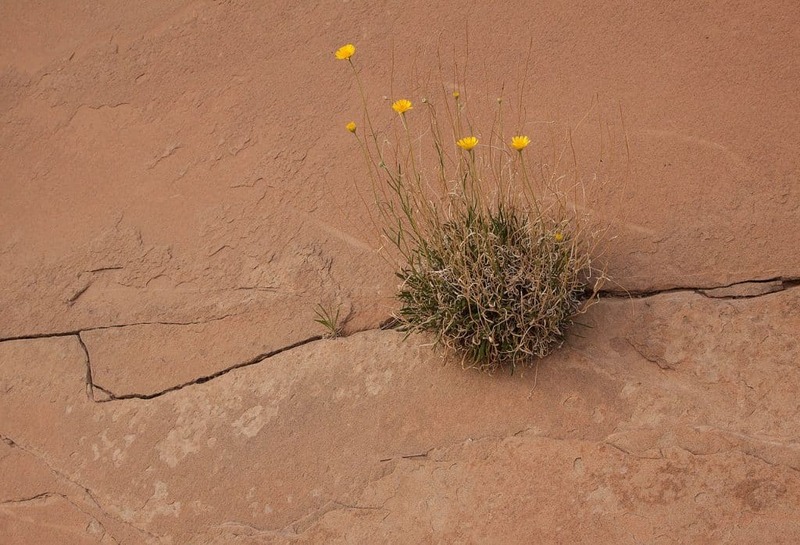 It may seem devoid of plants and wildlife out there, but the desert is actually home to many dangerous and poisonous things. You’ll experience flash floods(! ), dust storms, scorpions and venomous snakes, centipedes, spiders and Africanized bees. There’s also the mountain lions, the coyote bobcats and of course, the rattlesnakes. You can prepare for these wildlife threats by carefully choosing where you rest. Spend some time scouting out the resting location and check for telltale signs of animals living nearby. 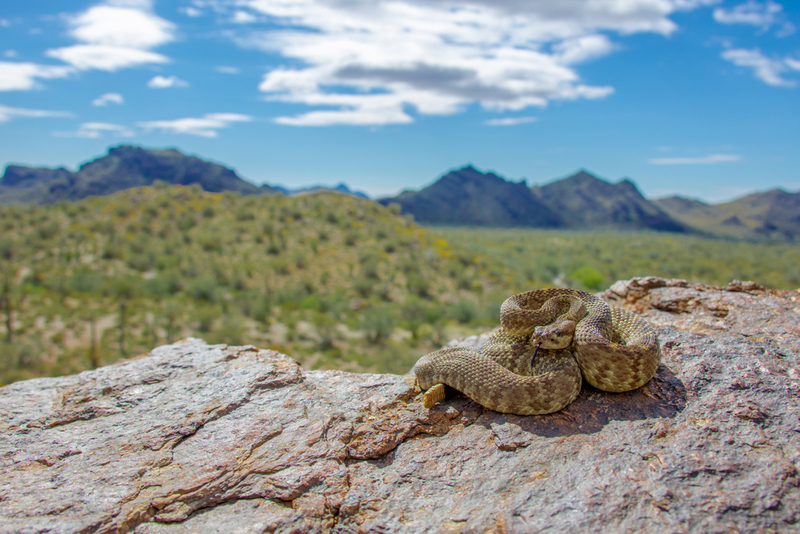 You may have a high supply of water and a means to survive for the next few days, but one bite out of a rattlesnake can bring an untimely end in a hurry. Check for sidewinders as well. Scorpion stings are possible but they are rare. This can be avoided simply by doing a quick inspection of where you’re sitting in order to avoid a surprise attack from a scorpion that could be as terrified as you are. You may be surprised to see flash floods written down in a desert survival article, but it’s definitely possible and really dangerous if you’re caught unprepared. The desert floor is hard and dry from lack of rain. When a storm comes, the soil won’t soak it in instantly; instead, it will run and collect and turn into a deluge. The downpour and all that water may prove to be a blessing but you wouldn’t want to be swept away into a huge sharp rock cliff. The sheer volume of water can also drown you in seconds. Flash floods too can be avoided by being careful on where you rest. When setting down, you should avoid lake beds, ditches and dry channels. Any low-lying environment can fill up when the storm clouds come. Avoid traveling in slot canyons if you can. 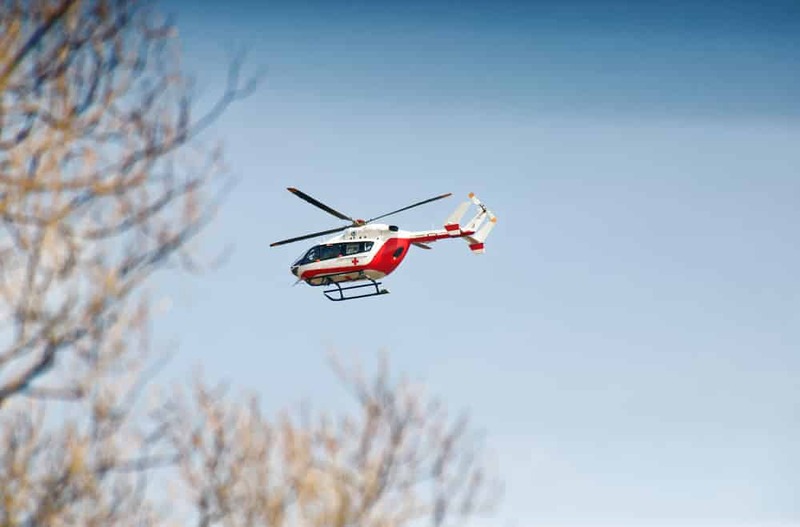 Get your signal tools ready for when you see signs of vehicles, copters and rescue parties. These cues must be different from nature sounds to increase your chances of being found. The humble signaling mirror is especially useful during the day. You can use a metal knife blade as an alternative. These will work as daylight flashlights that can notify passing airplanes and helicopters. The resulting reflection can be seen for miles all around. Take the time to learn how to use them. Prepare to use them and don’t wait for the emergency situation to come to you. If you’re in a pinch, break off your vehicle’s side mirror and use that for signaling purposes. A rescue team will be able to see fire from long distances in the flat desert environment. You can also set up perpetual distress signals by placing a pile of rocks into a triangular or a V-shape. If you have a way to create thick, black bellowing smoke, do so. Drain the oil from your vehicle and burn it. Take out your spare tire and puncture it. Remove the valve core to prevent unnecessary explosions and hurting those around you. Setting up a burning oil crate is a very effective signaling tool that people can see for miles around. 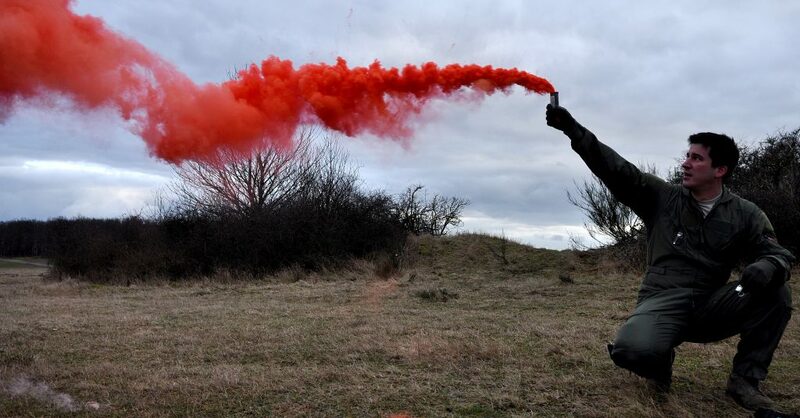 Use flares at night and only when you see a rescue plane or a helicopter. It can also be used in a pinch to start a fire at night. Audible signals should be let off in groups of 3. A long blast may sound like a plaintive wail of a hawk, but 3 short whistle blasts are a distinct cry for help. Remember to pack in whistles in your desert survival bag or everyday carry bag. It can bring manual search parties ever closer to your location. We hope you liked this article on dessert survival. If you have or know of any amazing survival stories in a desert climate or any other climate, please do share your story and let us know what specific skills, tools, and decisions made the live or death difference. 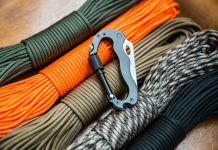 Previous articleWhat is the Best Slingshot for Survival? Free Guide! I don’t live near any desert areas, but that doesn’t mean I couldn’t be affected. Whether I’m forced to travel or experience a weather pattern change- it’s better to be prepared. Thanks for sharing the tips.